5.0: Format All-Star. This card is a total Bomb card. 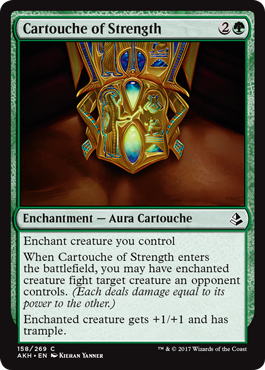 For those that aren’t familiar with this term, it basically means this card will win you the game if left unchecked for a turn or two. These cards tend to be hard to defend against and can turn a game around in a hurry. Some cards that are bombs in limited may only be a mediocre card in constructed play. 4.0: Above Average Card. This card is great. It can be played in multiple decks and will have an impact on the game every time. These cards can change a game quickly, get you back in the game, or shift the tempo of the game. These cards are usually vulnerable to some type of removal (or are a removal spell themselves), but they make up the majority of cards found in major tournament decks. 3.0: Average Card. 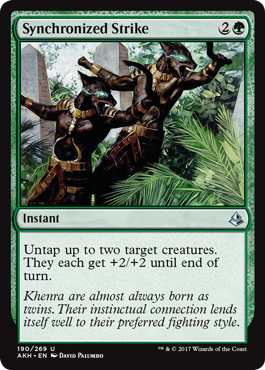 These are generally good cards, and many of them will be the majority of cards found in a tribal deck. Cards in this category are usually similar to other (higher-ranked) cards but cost 1 mana more or have a drawback in some manner. In Limited play, these are the majority of your deck. 2.0: Niche Card. These cards serve are very narrow function and are usually meant for your sideboard. They could be removal spells that only remove 1 type of card, or cards with mediocre stats that have an ability that helps against opponents playing a certain color or strategy. In Limited play, these cards are put in your deck if you have no other options and need the card to reach your 40-card minimum deck size. 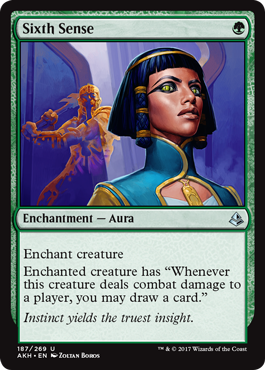 For Constructed play, you will rarely play this card unless it’s from your sideboard or you want to be “cute”. 1.0: Will Rarely See Play. The worst of the worst. These cards are rarely played (if they’re played at all). These cards generally have bad stats, cost too much mana, or have basically no impact on the game when they’re played. Overall stay away from this card if possible. Overall Thoughts: As long as delirium is a thing, cards like this have a decent chance of seeing play. Most other decks won’t want it, though. Overall Thoughts: Getting deathtouch when you attack isn’t exciting if your opponent has any chump blockers at all. 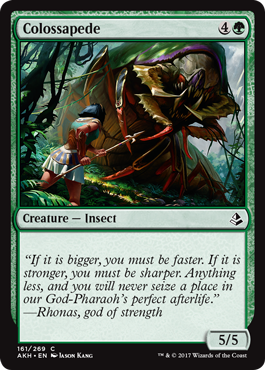 Most opponents will block this with their smallest creature, which will likely be able to kill this unless you have a spell to boost its toughness. But unless that spell also gives trample, that’s a waste of a spell in most cases. Overall Thoughts: This card not only boosts the enchanted creature’s stats, but it also provides trample, which can do so much when trying to deal the lest few points of damage needed to kill your opponent. 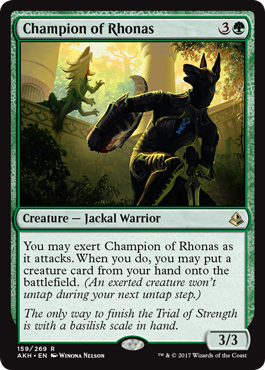 Plus, you have the option of fighting one of your opponent’s creatures if you want, so this is great as both an offensive card and a defensive one. 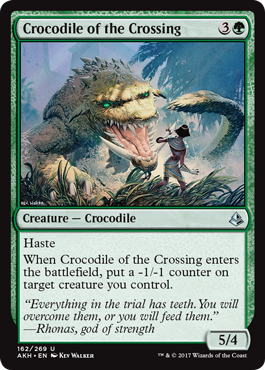 Overall Thoughts: The only reason this card doesn’t get a 5 star rating from me is that it doesn’t help you get the creature you’ll put onto the battlefield into your hand. Otherwise, in a deck with good card drawing and deck searching abilities, this card will be amazing, even if you only get to use it once before your opponent blocks and kills it. 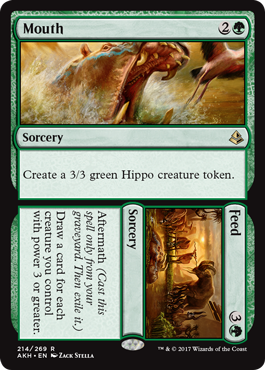 Overall Thoughts: A 3/4 for 2 mana is teriffic, even if you have to sacrifice another creature (by putting the -1/-1 counters on it). 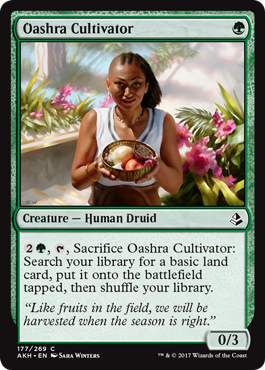 Or you can have a 0/1 mana producer that will gradually grow larger. Options are what this card is all about, so it has playability in both the early and late game. Overall Thoughts: I really don’t think that this card is bad, it’s just not exciting. A 5/5 for 5 mana is okay, but with no other ability, I just don’t see this being played anywhere in Standard. 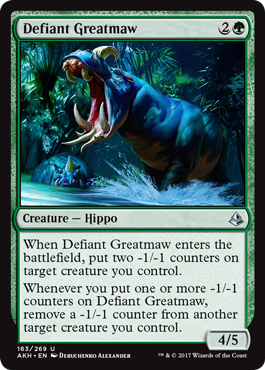 Overall Thoughts: Assuming you have to put the -1/-1 counter on this creature, getting a 4/3 with haste for 4 mana is pretty good. 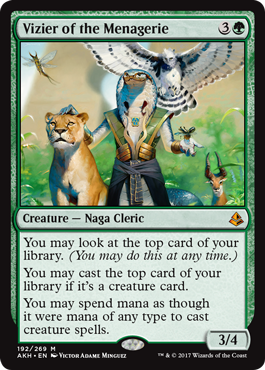 And if you can place the counter on another creature (preferrably one that can use the counters for some effect), this gets even better. This will be messing up combat for players throughout the multiverse. Overall Thoughts: So you want to play cards that give your creatures -1/-1 counters, but those creatures can’t utilize the counters and you’d like to get rid of them? Well, look not further. Have I got a hippo for you. This is also a nice way to remove pesky -1/-1 counters that your opponent has placed on your creatures. Overall Thoughts: Here’s a card that you can feel okay with putting in your main deck that might serve no purpose when playing against certain opponents. If your opponent isn’t playing artifacts, simply cycle this away for a different card. 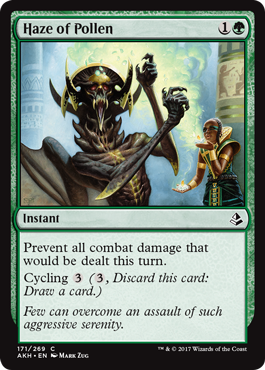 And this is a great card to include in decks built around cycling effects. 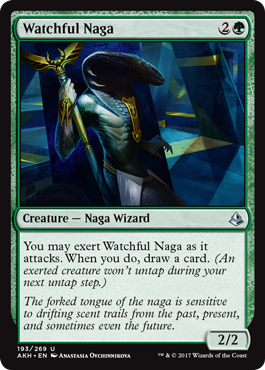 Overall Thoughts: Here’s a card that I definitely want to play after I have a creature in play that’s expendable. The ability to remove a -1/-1 counter from this card to gain 1 point of life isn’t worth sacrificing dealing the extra damage I can get when this attacks early on. And having a 4/4 for 2 mana is a really good rate of return. Overall Thoughts: Giant Spider is back again. 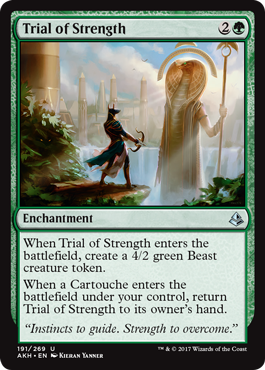 This offers green players a nice way to defend against most creatures. And it plays nicely alongside Ishkanah, Grafwidow. Overall Thoughts: It seems like it’s been a while since we’ve had any sort of mana accelerators like this in Standard, so this will be a welcomed addition to those decks that want to ramp up their mana in order to play bigger, tougher threats as soon as possible. This is likely to see some play. Overall Thoughts: In a deck that wants to ramp their mana up quickly or a cycling deck, this might see some play, but otherwise it’s tough to think that a 7-drop makes the cut. It has a nice ability that makes blocking it a difficult choice, but if it doesn’t come down until turn 10 or later, it won’t see much action. 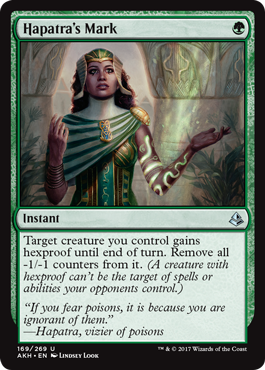 Overall Thoughts: Getting hexproof at instant speed is great. Play this alongside Blossoming Defense and you have 8 ways to ensure your creatures are safe from destruction (or many other nasty effects). 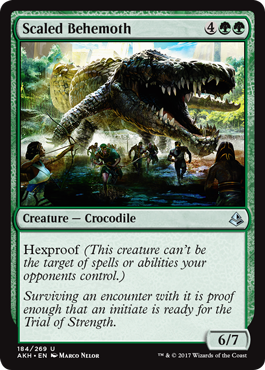 Removing -1/-1 counters from the creature is just a bonus (or penalty, possibly), the hexproof is the main reason to play this card. Overall Thoughts: Here’s a card that feels like it’s fighting its true nature. Most cards that get you lands to put onto the battlefield help you ramp your mana in order to play more numerous or bigger creatures. 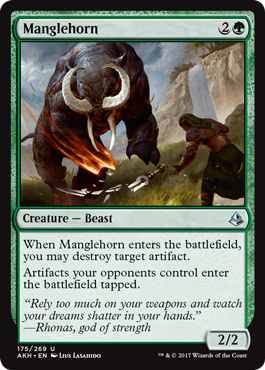 This card, though, wants you to already have tapped creatures on the battlefield in order to get a boost for your mana. It seems backwards. But it should bring new life to Cryptolith Rite decks. Overall Thoughts: There’s currently a decent amount of fog cards legal in Standard. Here’s another one that can be cycled away if it’s not needed. If there’s any sort of turbo fog deck to be built, this will see play in it. 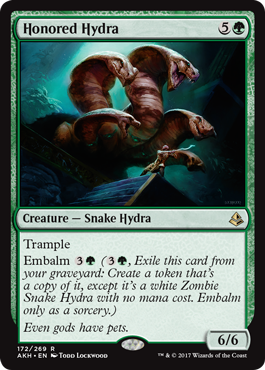 Overall Thoughts: Here’s an interesting embalm creature. A 6/6 with trample is a good card to play, and this is playable for 4 mana from your graveyard as an embalmed creature or for 6 mana from your hand. I would expect to see this as a good finisher for many decks running green mana. 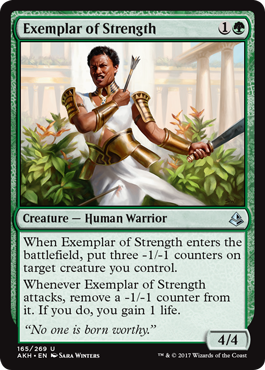 Overall Thoughts: There’s nothing super special about this card, but it is nice that when this exerts it gets a 4 toughness, which allows it to withstand many of Standard’s blockers. 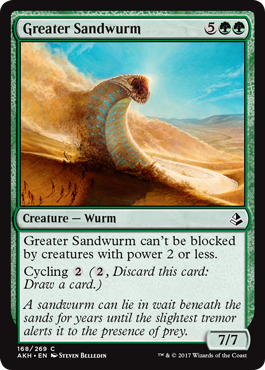 Overall Thoughts: The ability to untap a creature that has been exerted (or a land) is good. It would be better if this had trample or a way to become unblockable. Decks that have ways to provide one or both of these is where this card will shine. 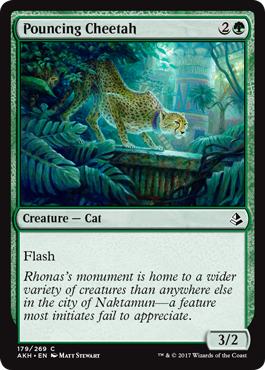 It also might see play in a cat tribal deck. Overall Thoughts: If Felidar Guardian doesn’t get banned, this is a good card to defend against the Copy Cat decks. The only reason I’m hesitant to give it a higher rating is because of the 2 toughness. If it were one more, it would be out of the range of Shock, which has seen play in the Copy Cat decks. 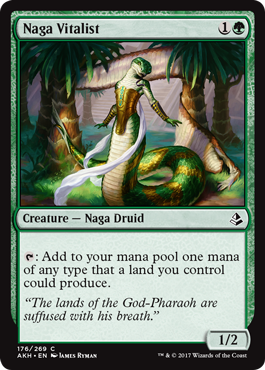 Overall Thoughts: I love the fact that this creature can tap for colorless mana if you have a land that can already provide it. 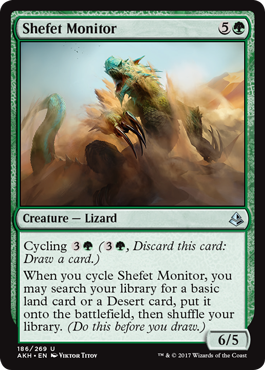 This is a good creature and could see play in other formats, not just Standard. Overall Thoughts: The fact that this card doesn’t ramp your mana until turn 3 at the earliest added to the fact that it can only find a basic land makes this card no good for Standard. I don’t expect this to see any play. Overall Thoughts: Unless you’re playing a deck that wants -1/-1 counters, there’s no reason to play this card. 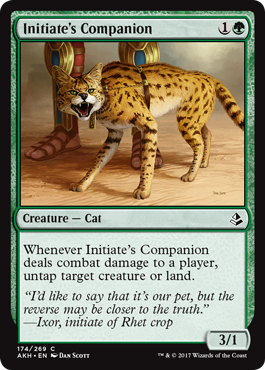 Overall Thoughts: In a cat tribal deck, the rating for this card probably goes up to a 3.5. In other decks, this is a good card to flash in as a surprise blocker, even if it will likely die in the process. Overall Thoughts: With the release of Amonkhet there will be 7 sets legal in Standard. There’s always a better chance that a control deck will become tier 1 when there are more sets legal in Standard. As such, this card is very playable. 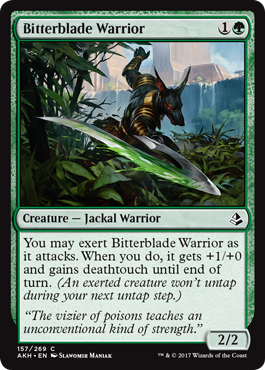 Once you get it in play, it will become the target of all of your opponent’s removal if they ever plan on countering any creatures again, so be sure to back it up with Blossoming Defense and Hapatra’s Mark. Overall Thoughts: This card is good for removing unwanted counters that your opponent has placed onto one of your creatures, or for adding counters that will benefit you. 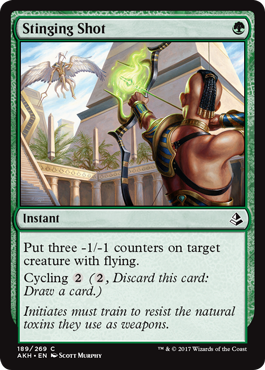 The fact that it can target any permant (like maybe a planeswalker) is what makes me think this might see some play. 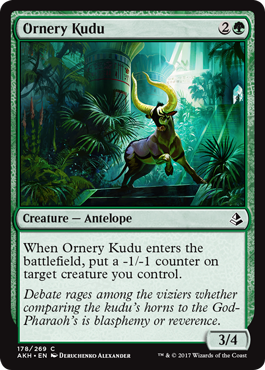 Overall Thoughts: The fact that this card is dependant on you having at least 1 other creature with power 2 or more in play in order to attack or block is the only thing preventing me from giving this a 5-star rating. 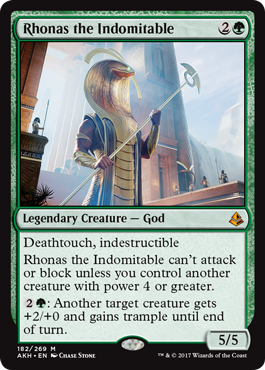 Deathtouch is fairly redundant on a 5/5, but there will be god vs. god battles that will make this relevant. This card should see a lot of play. Overall Thoughts: If you somehow manage to cheat this into play or cast it before turn 8, this card should help you win the game. 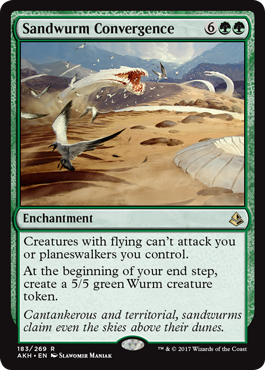 Keep in mind that your opponent’s flyers can still block, they just can’t attack, so you might want to throw the wurm token this enchantment creates at them for a few turns in order to soften up their blockers if they have flying creatures. 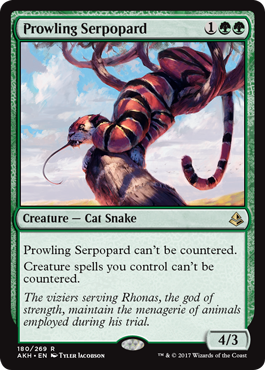 Overall Thoughts: This seems really good alongside Prowling Serpopard as a nice finisher. It’s expensive, but the stats and hexproof more than make up for the cost. 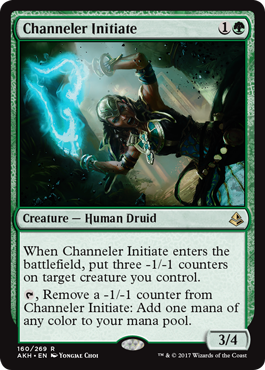 Overall Thoughts: Even without taking into account the ability to remove a -1/-1 counter from the targetted creature, getting a +2/+2 bonus for 1 mana is decent. And when the counter removal is relevant, this is basically Giant Growth. 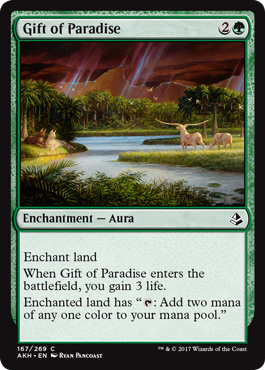 Overall Thoughts: The fact that you can get a basic land when you cycle this card is a benefit. I’m not too sure if getting a desert is a benefit or a trap. I suppose that depends on whether you need colorless mana or not. Either way, this card isn’t exciting and there are likely to be better options to play. 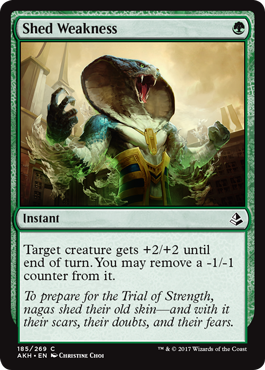 Overall Thoughts: I like this card and can imaging it being played in decks using Key to the City or Slither Blade. It also works well with creatures that fly or have trample. I sense a home for this in Standard. 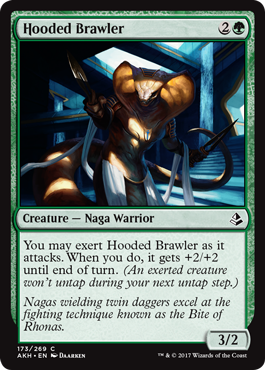 Overall Thoughts: This is a good sideboard card to bring in against decks with lots of flyers. Alternatively, this is an expensive way to untap a creature that has just exerted (at the same time as giving it a combat bonus). 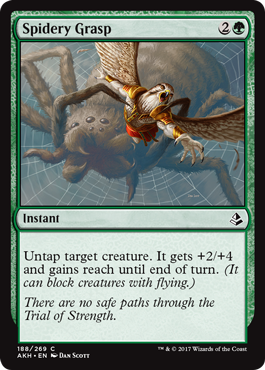 Overall Thoughts: Green usually doesn’t get ways to deal with flying creatures, so this card is a real treat. If the 3 -1/-1 counters don’t outright kill the targetted flyer, it will severely limit its usefulness. 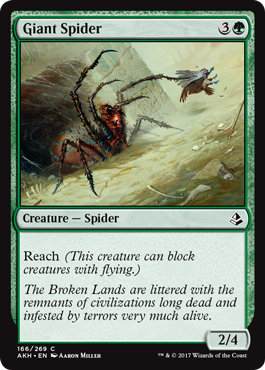 Overall Thoughts: Remember how I said Spidery Grasp was an expensive way to untap a creature that has just exerted (at the same time as giving it a combat bonus)? Well, that counts doubly here. Overall Thoughts: Getting a 4/2 Beast for 3 mana is pretty good. Being able to do it multiple times (by playing cartouches) is even better. Overall Thoughts: This card is amazing. It does it all. It gives you an extra card in your hand (if the top card of your library is a creature), it allows you to cheat on mana costs by using any type of mana for creatures, and you will always know what your next card is but your opponent won’t, since the card isn’t revealed. Amazing! Overall Thoughts: I want to give this a higher rating, but I can’t. The 2 toughness is a real hinderance on this card. I imagine this will be dead much of the time before it’s able to exert to draw a card, but perhaps I’m wrong. Overall Thoughts: The two halves of this card have good synergy. Creating a 3/3 for 3 isn’t that exciting, but drawing cards can be. These cards with aftermath are really hard to evaluate since there are 3 different ways they can be cast in a turn (from the hand, from the graveyard, or both). The two halves on this work well together, so it feels like this will see some play. 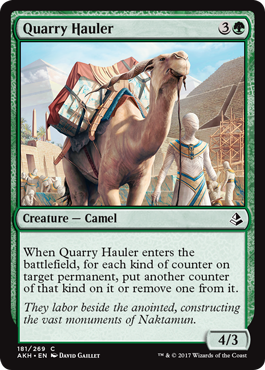 And that ends my review of the Green cards in Amonkhet. Let me know your thoughts by leaving a comment below. 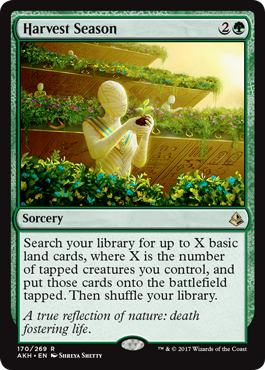 Tomorrow we’ll wrap up this series of reviews by looking at the remaining cards (multicolored, artifacts, and lands). Be sure to join me to find out my thoughts on how those cards will affect Standard. I’ll see you then! Amonkhet, Card Review, magic the gathering, Mike Likes, MTG, MTGDecktechs, Raise Your Standards, Set Review, Standard, Wizards of the Coast. Bookmark. All original content on this page is © 2018 MTGDeckTechs.com and its columnists and may not be used or reproduced without consent. Wizards of the Coast, Magic: The Gathering, and their logos are trademarks of Wizards of the Coast LLC. © 2018 Wizards. All rights reserved.